I choose the work And Babies by the Art Workers Coalition to analyze the text and image relationship. The poster was created as an anti-vietnam war protesting 1969. 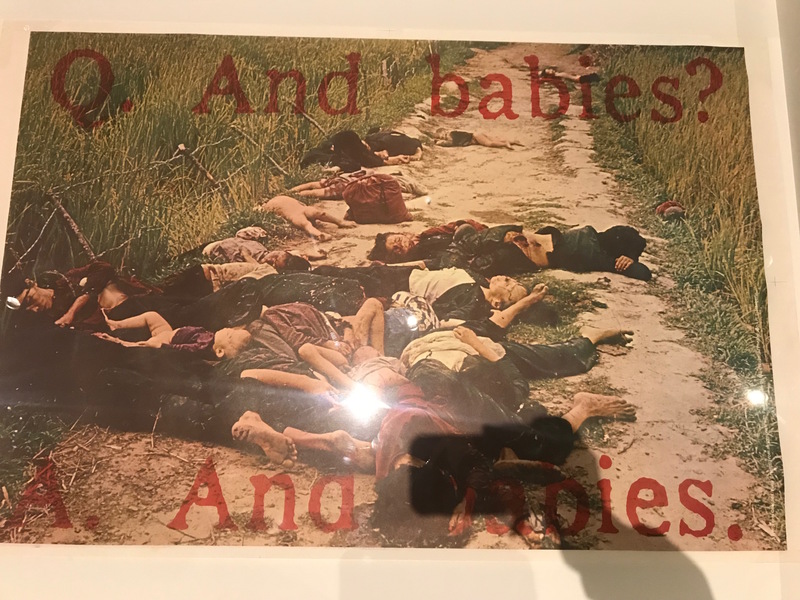 It approapriates combat photographer Ronald L. Haeberle’s photo documenting the My Lai Massacre. The photo shows a stack of dead bodies, which, image alone, is very powerful. The Art Worker’s Coalition group then approapriated a quote from an interview of one of the soldiers who was a part of the massacre. The text says “Q. And Babies?”, “A. And Babies.” referencing the interview. Combining the text and image adds context to the image as well as makes them think about the bodies as individuals rather than an image. I see the piece as just as much image as it is text. Both parts have a very strong meaning by themselves but together they are even more powerful. I also think by using an image that was already more recognizable, it would make people take the time to read and contemplate the added text. The typography that was used in the image feels printed, however, the text isn’t very crisp, suggesting that it may be a screen-print. It is in a transparent red shade allowing the viewer to see through to the image. The text is separated at the top and bottom of the image, making the reader ready the question “Q. And Babies” and pause to look at the image before confirming “A. And Babies.”. The text feels approapriate because the typeface they used legible even though it integrates into the background. They also printed in red which feels like it could be representational of the bloodshed from the massacre. Although the image could be considered a collage because it uses text and image from two different sources, it doesn’t feel like a collage. I think they chose to screen-print the poster in order to get the image out into the public as much as possible.